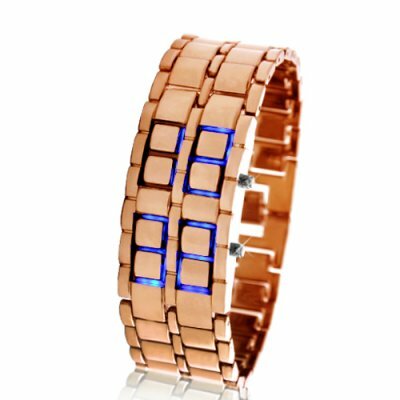 Successfully Added Bronze Samurai - Japanese Inspired Blue LED Watch to your Shopping Cart. In his younger days, the Bronze Samurai was a hoodrat and well-known only for his ability to get into fights - and come out unscathed. It wasn't due to his agility, nor was it due to his reflexes, but in fact because of his superior fortitude and toughness. It became the talk of the town and word spread across the land. Famous fighters from all over came to test their strength against the rumored Bronze Samurai. None were victorious. The deadly swordmanship of Miyamoto Musashi was of no use, nor the venomous techniques of Hattori Hanzo. If the Bronze Samurai was knocked down, he would get up immediately. To him, no strike was too hard and no weapon was too powerful. It was not long before Oda Nobunaga heard of the Bronze Samurai's feats and personally went to recruit him. He would then become the pillar of the mighty force that united all of Japan. As years went by, the boy became a man, the man became a warrior, and the warrior became a legend. He proved himself in the Battle of Okehazama, he fended off cavalry in the Battle of Nagashino, and he was the stone wall that made Kiyosu Castle impenetrable. Not a single day went by without mention of the might Bronze Samurai, but by then his name and rank had already changed - he was the Gold Samurai. Even as he rose in rank and status, the Bronze Samurai never forgot his roots. Finally, upon his death bed, the Bronze Samurai chose to have his spirit infused into this famous LED Watch. His final words: "Let this LED Watch be a symbol of hope. Let it remind us that no matter how hard the times or how hard the fight, we never give up." Now, this legendary LED Watch has made it to Chinavasion. Even if you don't intend on buying one for yourself, stock your online store with these historical watches to lock in some amazing profits! Unlike other online stores where you'll have to wait several weeks before you receive your Bronze Samurai Watch, order your LED watch from Chinavasion today and we'll express ship it out tomorrow. That way you can be the first to offer your customers this amazing Japanese LED watch! Order from us and get it in a few days instead of a few weeks!